For the term used for residents of the United States, Canada and Caribbean countries with roots in the Indian subcontinent, see Indian Americans, Indo-Canadians, and Indo-Caribbean. For other uses, see East India (disambiguation). East Indians or East Indian Catholics, are an ethno-religious Indian Christian community who are members of the Catholic Church. They live primarily in the city of Mumbai, with smaller populations in portions of Palghar and Thane districts in the Indian state of Maharashtra. According to tradition, Bartholomew the Apostle visited India and elsewhere during the first century AD. The Dominican friar Jordanus Catalani, who was Catalan or Occitan (southern French), began evangelizing in Sopara, Thana and north Konkan. Sopara was an ancient port and an international trading center. Most Indian church history was lost between the ninth and fourteenth centuries as Persia converted to Nestorianism in 800 AD. Since church offices and public worship was dependent on a foreign source, when the foreign aid was withdrawn Indians became nominal Christians. The Portuguese came to India in 1498, and their policy was to return the Indian Christians to Roman Catholicism. Although Brahmins and other high-status Hindus who were ceremoniously converted by the Portuguese were treated with honor and distinction, groups engaged in agriculture, fishing and other rural occupations handed down by their ancestors received neither secular nor religious education. Among the Portuguese converts were a number of descendants of the Christian community reportedly founded by Apostle St. Bartholomew, whom the Portuguese molded into a community sometimes known as "Portuguese Christians". The Franciscans spearheaded the evangelization of the "Province of the North" (Província do Norte). From 1534 to 1552 a priest, António do Porto, converted over 10,000 people, built a dozen churches and founded a number of orphanages and monasteries. Prominent among the converts were two yogis from the Kanheri Caves who became known as Paulo Raposo and Francisco de Santa Maria. They introduced Christianity to their fellow yogis, converting many in the process. Another notable convert during this period was the Brahmin astrologer Parashuram Joshi, who was baptized on 8 September 1565 with the name Henrique da Cunha. Joshi was followed by 250 Hindus, including over 50 Brahmins. In Salsette, the priest Manuel Gomes converted over 6,000 Hindus in Bandra and was known as the Apostle of Salsette. In 1573, 1,600 people were converted. Beginning in 1548, Jesuits in Bassein (Baçaim) and Bandra converted many upper-class Indians; Bassein Cathedral recorded 9,400 baptisms. The Jesuit superior Gonçalo Rodrigues baptized between 5,000 and 6,000 people in Thane (Tana), many of whom were orphans or the young children of lower-caste Hindus who were sold by their parents. By the end of the 16th century the Roman Catholic population of the Portuguese Province of the North was 10,000 to 15,000, centered mainly in and around Bassein. After the defeat of the Portuguese by the Maratha, Catholics were discriminated against by the state government. Following the fall of Bassein, many Catholics were heavily taxed by Maratha who used the money to feed Brahmins and conduct a successful campaign to return them to Hinduism. Most Portuguese priests were forced to leave, and only five churches (three in Bassein City, one in Bassein District and one in Salsette) were permitted to remain. The remainder of the Christian population was left to native clergy under a vicar general in Kurla. When Antequil du Perron visited Salsette in 1757, he found a flourishing Catholic population with many churches rebuilt and Christianity practiced openly but no European priests. Changes occurred under British rule. On 11 May 1661, the marriage treaty of Charles II of England and Catherine of Braganza—Catarina de Bragança, daughter of King João IV of Portugal—made Bombay part of the British Empire as intended since the British takeover of Surat (allegedly as part of Catherine's dowry to Charles). A weakened Portugal, no longer part of the Crown of Spain, had to oblige. Nevertheless, parts of present-day Mumbai (such as Bandra, Thane and Vasai) remained Portuguese well into the first third of the 18th century. Since the early days of the East India Company, there were no other Indian Christians in the North Konkan except the East Indian Catholics. Employment intended for Christians was monopolized by the East Indians. With railways and steamships came immigrants from Goa who were also known as Portuguese Christians. The British adopted a designation which would distinguish the Christians of North Konkan (who were British subjects) from the Goan Catholics, who were Portuguese subjects (the Mangalorean Catholics were no longer Portuguese subjects). For Queen Victoria's Golden Jubilee, the Christians of North Konkan changed their name from "Portuguese Christians" to "East Indian" to impress on the British government of Bombay that they were the earliest Roman Catholic subjects of the British Crown in that part of India and were entitled to certain natural rights and privileges compared with the immigrants. The Bombay East Indian Association was founded on 26 May 1887 to advance the education, employment, rights and economic development of the East Indians. P. F. Gomes, who was knighted by Pope Leo XIII in 1888, was its first president and J. L. Britto its first sSecretary. D. G. Almeida donated ₹100,000 to establish an education fund. During the 1960s, the Archdiocese of Bombay estimated that there were 92,000 East Indians in Bombay: 76,000 in suburban Bombay and 16,000 in the city. In September 2014, local non-governmental organizations such as the Watchdog Foundation, Mobai Gaothan Panchayat, the Bombay East India Association, Vakola Advanced Locality Management, Kalina Civic Forum and the Kolovery Welfare Association formed the Maharashtra Swaraj Party (MSP). The party, which represents the East Indian community, was expected to support five candidates from Mumbai's suburbs in the 13th Maharashtra Legislative Assembly elections. A typical Koli house consists of a veranda (oli), used for repairing nets and receiving visitors; a sitting-room (angan), used by women for household work; a kitchen, a central apartment, a bedroom, a devotional room (devaghar) and a detached bathroom. East Indian Catholics speak a dialect of Marathi, which they retained despite Portuguese influence. The Marathi language is central to the community's identity. The author of Trans. Bomb. Geog. Soc., 1836–38, Vol. I. mentions the dialect of Marathi spoken by the East Indians of Salsette, Mahim, Matunga and Mazagon, similar to the language spoken by the Kulbis, Kolis, Bhandaris, Palshes, Prabhus, Panchkalshis, Kuparis and Vadvals; this may have been Konkani. Some East Indian upper-class families in the Khatri ward of Thane speak Portuguese. 110 Portuguese lexical items are found in Marathi. Traditional dress for women is the lugra, and for men are khaki shorts and a white banian. A Koli Christian bridegroom usually wears an older Portuguese admiral's uniform, which is preserved and lent out for such occasions. East Indian women wore a blouse and cotton lugra, with the back pleats tucked into the waist; women did not use of the upper portion of the sari (covering the head and breast) until they were married. This mode of wearing the sari is known as sakacch nesane. Gol nesane, a cylindrical style, is popular with young girls and women. There are five East Indian cultural groups: Kulbis, Samavedi Christians (commonly called Kuparis), Koli Christians, Wadvals and Salsette Christians. The film Tu Maza Jeev, in the East Indian language, was released on Maharashtra Day in 2009. East Indians organise singing competitions in their own language. 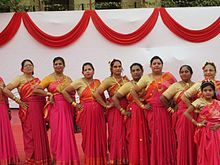 The competition is primarily held in the evening of important village occasions; for example, Kurla has an annual competition on the eve of the phool dongri feast in May at Holy Cross Church. Mark Joseph Dharmai: Para-athlete (Bronze Medalist in the 2017 Doubles BWF Para-Badminton World Championships). ^ "Catherine of Bragança (1638–1705)". BBC. Retrieved 3 June 2009. ^ "MSP announces candidate list for assembly elections". I am in DNA of India. 23 September 2014. Retrieved 26 September 2014. ^ "The East Indian Community Original Inhabitants of Bombay, Salsette & Thana". ^ "First East Indian movie releases on Maharashtra Day". The Times of India. 4 May 2009. ^ "WN - east Indian singing competition uttan pali". wn.com. Retrieved 15 February 2017. ^ "The East Indians of Kurla". geracao.in. Archived from the original on 15 February 2017. Retrieved 15 February 2017. ^ "Phool Dongri Feast - 10th May 2015 - Holy Cross Church". www.holycrosschurch.co.in. Retrieved 15 February 2017. ^ Target Goa. "Two hats of James Ferreira couture and activism". targetgoa.com. Archived from the original on 22 September 2013. Retrieved 3 June 2013. ^ Dhyan, Chand (1952). GOAL. Chennai, India: Sports & Pastime. p. 10. ^ "Genelia awarded for promoting East Indian culture through wedding rituals - Times of India". The Times of India. Retrieved 19 November 2017. Gazetteer of Bombay City and Island. I, I & III. The Gazetteers Department (Government of Maharashtra). 1997 . Retrieved 15 January 2009. Gazetteer of Bombay City and Island. I. The Gazetteers Department (Government of Maharashtra). 1986. Retrieved 15 January 2009. Look up East Indian Catholic in Wiktionary, the free dictionary. This page was last edited on 22 April 2019, at 07:26 (UTC).